By the end of the 1950s, weather modification had evolved from being a matter of changes in local weather (clearing fog, preventing frost on tender young fruit, reducing hail damage, generating rain) to massive plans for climate control. One of the more grandiose schemes proposed by Russian scientists was to eliminate the Arctic ice cap in an attempt to warm up the northern (and very cold) regions of their country to improve their habitability. While the proposal itself may have been rather farfetched, it did inspire atmospheric scientists around the world to start asking the question, What would happen to the world's climate if the Arctic ice melted? The possibility of global warming due to an increase in critical atmospheric gases (carbon dioxide, water vapor, methane) raised the threat of shrinking glaciers and ice sheets. Increases in pollutants in the form of dust and debris (termed aerosols) in the atmosphere raised the issue of potential global cooling by blocking sunlight. The time was right for taking a fresh look at the global energy budget. 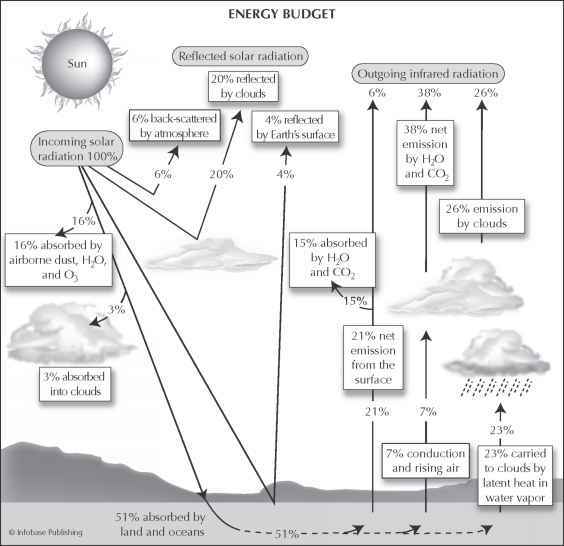 Scientists considered three primary energy budget-related mechanisms: changes in planetary albedo (the reflectivity of Earth's surface), the solar constant (the amount of energy emitted by the Sun), and atmospheric turbidity (the extent to which aerosols reduced incoming solar energy). Working independently, in the late 1960s the Russian meteorologist Mikhail I. Budyko (1920- ) and the American meteorologist William D. Sellers both reached the same conclusions about these factors' roles in climate change. The energy budget describes the relationship between incoming and outgoing radiation. water, an Antarctica free of ice would absorb much more energy and contribute to significant temperature increases everywhere but the equator. rate were cut in half, temperatures in the Tropics would plunge by 31°F (16°C) and snow would almost reach the equator. On the basis of these outcomes, Budyko and Sellers determined that climate models needed to consider both the possibility of changes in heat transfer within the Earth/atmosphere system and changes in the solar constant, since they could effectively cancel each other out. Exactly how changes in incoming radiation might change the circulation pattern was unknown, but they certainly needed to be considered. In a much-cited 1966 paper by Budyko and others entitled "Impact of Economic Activity on Climate," they pointed out that people were using increasing amounts of energy (in particular fossil fuels) that were converted to heat. The annual rate of increase was 4 percent. If that rate continued, Budyko argued, in less than 200 years people would actually be producing more heat through their everyday activities than would arrive from the Sun. People would be creating their own climate. Although Sellers thought this was a little extreme, he acknowledged that the effect was likely to be greatest in the middle to high latitudes of the highly industrialized and populated Northern Hemisphere. If people continued to make a significant impact on the atmosphere, Sellers conceded, the temperature increase could melt the polar ice caps. As the ice caps thin and glacier melting accelerates, the role of albedo in climate change is sure to take on a more important role.